Foreign banks are pulling out of Russia despite investing heavily in the early 2000s. The gold rush into Russia’s retail banking business has come to an end after two of the world’s biggest names says they will sell off their Russian high street banks. Britain’s HSBC and Barclays Bank are the most high profile of a string of foreign banks that are giving up on Russia. Both plan to sell their retail banking operations despite having invested heavily into the business. 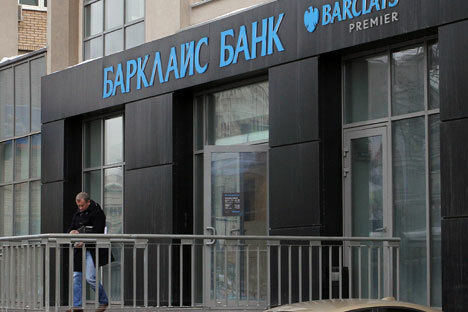 With a population of more than 142 million people, but a very low banking penetration – only one in four Russians have any sort of bank account at all according to some polls – the retail banking business was doubling in size every two years prior to the crisis, leading to a stampede by international bankers into the market from about 2004 that sent prices for bank acquisitions through the roof. Barclays Bank paid top dollar for Expobank, based in Russia’s Far East, in March 2008 for £373 million ($606 million) at the very top of the banking boom, valuing the bank at a whopping six times book value. Over the next few years, Barclays rapidly rolled out a retail offering across the country. But in the middle of February, the bank announced it was seeking a buyer for its retail business and would focus solely on investment banking. “The people in London realize that they paid stupid money for these banks. There was a rush into Eastern Europe but now they are willing to write off a big loss. It seems to me to be a very emotional decision,” said Sergei Nazarov, head of Renaissance Asset Managers financial institutions fund. A week later HSBC was also reportedly pulling the pug on it retail operations just two years after announcing ambitious growth plans, although the bank has not confirmed reports. The exit of the two British banks comes after a string of smaller bank gave up on the Russian market. Holland’s Rabobank gave up its Russian retail license last year. Spain's Santander sold its Russian business to local player Orient Express in December. And both Belgium’s KBC Groep NV and Swedbank AB, the biggest Baltic lender, have also cut back their Russian operations in the last year, citing stiff competition as the cause. The reasons for the whittling down of the number of foreign players are multiple. The crisis has obviously depressed earnings and saw the number of non-performing loans soar. At the same time, almost all of Russia’s banks slashed interest rates as the crisis receded in an effort to rebuild their deposit basis, reducing the profit margins for everyone in the sector. And finally the relentless expansion of the two state-owned giants of the sector – Sberbank and VTB Bank – means competition has become increasingly tough. Founded in the Soviet era, Sberbank is a monster with about 20,000 branches nationwide and accounts for 27 percent of Russian banking assets and 26 percent of banking capital. VTB’s retail business, VTB-24, has more than 530 offices. Most of the bigger private retail banks have at best a few hundred branches, mostly concentrated in Russia’s biggest cities. However, a few foreign banks have succeed in gaining a toehold in Russia; foreign banks cumulatively account for just over a quarter of the sectors’ total assets as of January this year. France’s Societe Generale is probably the most successful after it bought a string of banks as well as launching a greenfield retail operation of its own over the last decade. The bank has almost 3 million clients and its consumer unit posted a €13 million ($18 million) profit in the fourth quarter of 2010, following a loss of €58 million ($80 million) a year earlier, according to the bank’s website. The bank says Russia will be the biggest contributor to it international retail earnings by 2015.